Follow Scottish Challenge Cup first round score updates on BBC Radio Scotland's Sportsound - Open all Mics using the play button or via the 'Live Coverage' tab. Thanks for your company and contributions today. Enjoy the rest of your afternoon. "They came in at 2-1 and built from there. Hopefully there's still a long way to go. To come here and get that result is obviously very pleasing. Depth of squad will be important and the substitutes made a difference when they came on." Bob Perth: "Pity but not surprising that stubs reckons there wasn't much in it between the sides...he talks nonsense..."
Anonymous: "Rangers work ethic today was impressive And their style of play was a breath of fresh air and six well taken goals what more can you ask for (apart from signing Scott Allan !)" "We gave some poor goals away. I didn't think there was a lot in the game, especially first half. We made poor decisions, lapses in concentration. To be honest, I'm glad it's happened today and not in two weeks' time." Almost time for me to go. 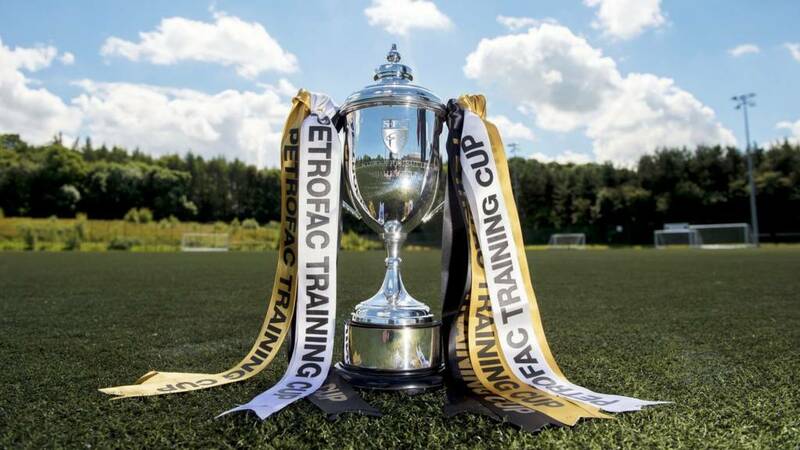 You can listen to Sportsound - Open all Mics coverage of the rest of today's Scottish Challenge Cup first round ties on BBC Radio Scotland and here on the BBC Sport website. Glenn: "Good performance from Rangers, looks like it'll be a good season for them #bbcscotfootball"
James Gutteridge: "Mark Warburton, the Ibrox Mourinho #bbcscotfootball"
It's all over and Rangers progress, handsomely in the end. Some ruthless finishing from the visitors, helped by some poor defending and goalkeeping from the hosts. Hibs too had their moments but they will want to put today behind them. One minute of stoppage time begins. Hazy: "Either Hibs are very poor or Rangers are playing very well. Surreal... Actual football. #bbcscotfootball"
It's another for Kenny Miller, who applies the finishing touch to Barrie McKay's inventive run on the right. David Gray heads in Lewis Stevenson's cross but the offside flag cuts short the Hibs captain's celebrations. Although goals have not been in short supply today, good defending has. In the latest example, Rangers gift the ball to Hibs and Lewis Allan curls a shot over. Substitute Kenny Miller adds his name to scoresheet, bundling in Nicky Clark's cross from the right after Hibs conceded possession near halfway. Around 15 minutes left at Easter Road. Martyn Waghorn makes way for Nicky Clark in Rangers' final change. Two debut goals for the striker today. Just before that fourth Rangers goal, the visitors sent on Kenny Miller and Dean Shiels in place of Jason Holt and David Templeton. Rangers quickly restore their two-goal lead with Andy Halliday, another debutant, curling the ball in off the underside of the bar. Suspect positioning from the goalkeeper but a superb strike. Jason Cummings coolly tucks away the penalty and Hibs are right back in this match. Jason Cummings goes down after being challenged by Barrie McKay and the hosts have a spot-kick. Hibs' Scott Allan makes his entrance, coming on for the injured Jordon Forster. Nicky Law drags a shot wide at the end of a sweeping Rangers counter attack. Paul Hanlon loops a head over the Rangers crossbar as Hibs try to get back into this match. It's another for Rangers and another for Martyn Waghorn but Hibs goalkeeper Mark Oxley will not want to see that again. The striker's shot from a tight angle on the left seemed to go straight through the keeper's grasp. The match resumes with Rangers kicking off. "It took a moment of individual aplomb to regroup Rangers, and James Tavernier's free-kick strike brought parity and renewed confidence. "Wahgorn converted the first clear opportunity created for him inside the area, so a half in which Rangers looked uncertain brought reward. "They need to show that they can build on that, though, with McKay and Templeton still too peripheral. "Hibs have shown that they can trouble the visitors' defence, so the second half is likely to be finely balanced." Referee Willie Collum brings the opening period to a close. Hibs will be fuming at being behind after enjoying so much possession and territory as well as a lead but those two Rangers goals late in the first half have turned the match in their favour. Stoppage time now being played in the first half. What a turnaround. James Tavernier does well to keep hold of the ball before unleashing Jason Holt, whose low cross is tucked away by Martyn Waghorn. An exciting first half is drawing to a close. Rangers will be delighted to be level having been second best for much of this first half. Almost as soon as they are level, a mix-up in the Rangers defence almost gifts the hosts another goal. Wes Foderingham waits too long to make a clearance, Lewis Allan closes him down and the visitors eventually get it out for a corner. Paul Hanlon fells Jason Holt right on the edge of the box. Three players stand over the ball before James Tavernier curls a sweet striker past Mark Oxley. Rangers are still struggling to retain possession in attacking areas. They lack the fluency and composure Hibs have shown so far. That said, the hosts could have made more of their dominance in this first half. Liam Fontaine glances a header wide from Sam Stanton's inviting free-kick but the offside flag had been raised against the Hibs man. "Hibs are worthy of their lead. Their attacks have carried a far greater threat and penetration than Rangers' forays upfield, with Jason Cummings often spinning into space behind the visitors' defence. "Hibs look comfortable, while Rangers are still trying to put the phases of their play together and have yet to create a clear cut opportunity. The midfield trio, in particular, need to be more assertive." Hibs are forced into a first-half change with Dominique Malonga coming off and Lewis Allan coming on. Rangers get some joy down the left with Lee Wallace cutting the ball across for Jason Holt to flash a shot wide. Hibs are playing with confidence now. Both full-backs are getting further and further up the field to supply ammunition for the forwards and Rangers are struggling to get out. Hibs have the lead and it's an excellent strike from Sam Stanton. The midfielder picks up inside the Rangers half, drives at the visiting defence and unleashes a fierce shot beyond Wes Foderingham. Danny Nicoll: "Scott Martin will have a screamer of a game and all will be forgotten with Scott Allan being on the bench. #bbcscotfootball"
Dominique Malonga fires well over after Lewis Stevenson knocks the ball across the penalty area. A decent chance for the hosts. Hibs threaten for the first time as Jason Cummings meets Paul Hanlon's cross and Wes Foderingham is forced to make an early save. A decent move down the left from Rangers as Lee Wallace is released into the box but his cross is cut out. Rangers start by not letting Hibernian have any time on the ball and a there's a couple of scrappy fouls. Hibs get the game going. Gav F: "Too hard to predict a winner today, I'm also not bothered either way as long as it's not Hibs..... #bbcscotfootball"
Anonymous: "Jim McLean was adamant Duncan Ferguson wouldn't be sold to Rangers but money talked. He was true to his word with Gough who got to Rangers via Spurs"
Brian in Grangemouth: "As a falkirk fan, i couldnt care less what scott allan does. Didnt impress in the games at falkirk. Think we will get into play offs this year, and hopefully a good cup run." "Rangers fans have spent the warm-up singing about Scott Allan, who is on the bench for Hibs and remains a signing target for the Ibrox club. "That storyline will become secondary when the game starts, though, with both managers wanting to set the tone for a competitive rivalry that is likely to stretch across the full season. "Seven new players in the Rangers side, none in the Hibs team, so a tie in a competition that is peripheral to the ambitions of both sides has significance." "Scott Allan's a Hibs player and right now my focus is and has to be on the Rangers squad. "This is game four of our pre-season programme and we're looking forward to it." You can watch Hibernian v Rangers on BBC Alba, listen to live commentary on BBC Radio Scotland 810MW/DAB and video and audio are available here via the 'Live Covearge' tab. To get involved in today's coverage, you can text 80295 or tweet using the hashtag #bbcscotfootball. Rangers hosted Hibs in last season's Challenge Cup first round and won 2-1 after extra-time. It was the first of seven meetings between the sides throughout the campaign with Hibs winning four of those encounters, Rangers three. Who will come out on top today?Image caption: Rangers hosted Hibs in last season's Challenge Cup first round and won 2-1 after extra-time. It was the first of seven meetings between the sides throughout the campaign with Hibs winning four of those encounters, Rangers three. Who will come out on top today? "First and foremost, I've got a really good relationship with Scott. I've made the decision for the players and for Scott. I won't fall out with Scott Allan, it's as simple as that. "We've said all along, Scott Allan is not for sale. He can go for free at the end of the season. Our stance is clear. I'm 100% certain that our stance will not change." Hibernian: Oxley, Fontaine, Hanlon, Forster, Gray, Martin, Fyvie, Stanton, Stevenson, Cummings, Malonga. Subs: Scott Allan, Reguero, Dunsmore, Harris, Sinclair, Crane, Lewis Allan. Rangers: Foderingham, Tavernier, Kiernan, Danny Wilson, Wallace, McKay, Halliday, Holt, Templeton, Law, Waghorn. Subs: Thompson, Aird, Clark, Miller, Shiels, McGregor, Kelly. Wes Foderingham, James Tavernier, Rob Kiernan, Jason Holt, Andy Halliday and Martyn Waghorn make their competitive debuts for Rangers while Danny Wilson makes his first competitive start since returning to the club. two failed bids by Rangers this week, is named as a substitute by Hibs for today's game. Scott Martin his given a first competitive start for the hosts. It's the first round at Easter Road with these two sides beginning their competitive season. Good afternoon and welcome to this lunchtime's coverage of Hibernian v Rangers in the Scottish Challenge Cup.